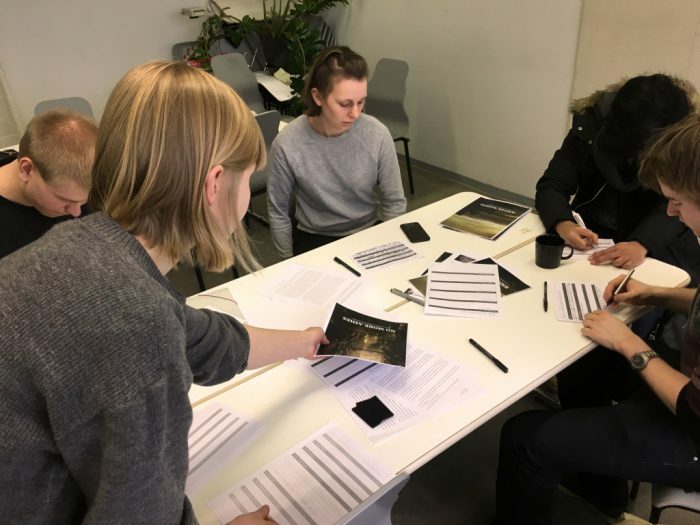 Sofi Perikangas’ and Francesco Fontana’s co-creative storytelling project explores how a professional writing process can be designed by using different co-design methods. The starting point for our project was an interest and love towards stories and fiction. We decided to explore, how could we manage to use different co-design methods in co-creating a story world and written fiction. We thought that through a designed writing process, it would be possible to inspire and guide professional writers, since even for them, it may be challenging at times to imagine a foreign living environment and write about it. To test these thoughts, we employed two professionals from the fields of fiction to take part in this experiment. The structure we started to create would work as a design tool and it could be helpful also in co-imagining and empathising with the so-called wicked problems (Rittel&Webber 1973) of the future, such as living in, forming and maintaining urban communities in environments hostile to people. As a platform, the tool could invite writers to take part in societal discussion. To a reader, fictionality works as an immersive but safe way to empathise with the wicked problems and topics alien to her. We chose an urban dystopia as a key element of the project. One question was, how will the writers handle a question of urban environment where pre-designed instructions offer them only limited resources for building up a literary city and plan its core functionalities. Whilst creating a methodological tool, we tested the writers’ abilities to achieve new kinds of visionaries through limitations which we presumed to scaffold their creative abilities. Over the project we were able to start producing the story, by feeding different kinds of assignments to the writers, writing background story by ourselves, and arranging a co-creation workshop with Aalto University students to create new elements for the story world. Self-publishing a book of the co-created story No More Ashes accompanied by a writing toolkit based on the methods created throughout the project. Our project is combining several different fields from game design to value fiction and literary research, and our wish is to create something unseen, to be able to create meaningful stories into people’s lives.